“I just want to take the opportunity to thank you for doing such a wonderful job once again on our law firm’s newsletters! The newsletters are spectacular and we have received many compliments from our clients thus far. “I particularly wanted to acknowledge your willingness to take on the difficult challenge of helping us produce a newsletter completely written in Chinese in addition to our English version. “The board of directors of our organization, the Virginia Medical Group Management Association, used to prepare and send out a paper newsletter each quarter. Because our board is made up of volunteers, it was difficult to find the time to layout, design and edit the newsletter. As a result, our newsletters were rarely published on time and lacked adequate editing and often contained articles that were of marginal interest to our members. “We selected CompanyNewsletters.com after seeing some of their work. We have been with them for more than a year now, and the service and quality have exceeded our expectations. We now have a newsletter that is packed with great content because our board can focus on getting the articles and CompanyNewsletters.com manages the layout, editing and graphics. The newsletters look very professional and are published on time. As if that isn’t enough, we also significantly reduced our publication costs. “[CompanyNewsletters.com offers a] very good value. That is one of the reasons that we switched companies. 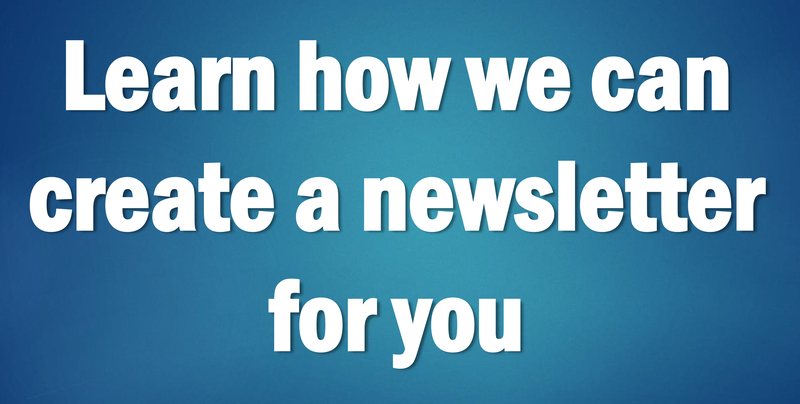 We get great service, a professional looking newsletter and at a reasonable price. — J. Taylor, AJ’s Seafood Grille, Ridgeland, Miss. — S. Johnson, marketing consultant, Andover, Minn .
— G. Tuttle, The Affinity Group Inc., Ventura, Calif.